Bluewater family cruiser with incredible steel construction. Low hours on rebuilt engine. 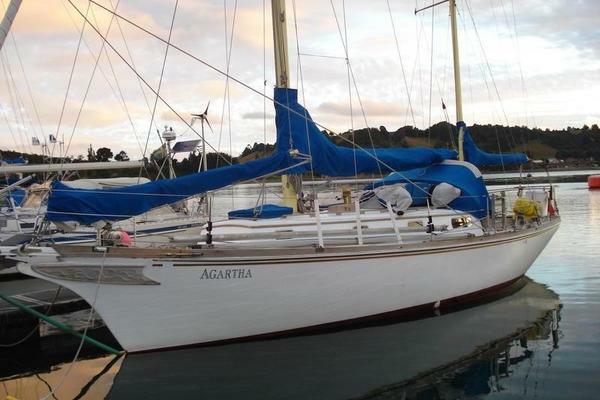 Full refurb in 1997, includes sails and rigging, solar, electronics, canvas. Gorgeous Blue hull painted in 2016.Equipped with a/c (main cabin), Watermaker and domestic comforts.Video of vessel under way and recent survey available upon request. United Yacht Sales New Jersey would love to guide you through a personal showing of this 50' Kanter Ketch 1986. This yacht for sale is located in San Carlos, Sonora Mexico and priced at $82,000. For a showing please contact us by filling out the form on this page and we will get back to you shortly! Full forward is a built-out workshop and storage area, with access to the chain locker. Immediately aft through a door is a double stateroom equipped with up and down bunks to starboard and modified work/study area with couch seating to port. Conversion to return the stateroom to the original twin bunks on either side, can be done quite easily. Generous storage all around and hanging locker to starboard. A door separates the stateroom from the area aft.Moving aft is a hallway lined with storage areas. To starboard, within one deep locker, is a separate freezer unit (non-operational). Forward head, sink and shower follows. Immediately across is the U-Shaped galley.Up two steps to the main salon with convertible dinette to port and interior helm station to starboard. Navigation station is further aft to starboard. Through another hallway filled with more storage cabinets is the aft master stateroom with en-suite head and shower.Engine is located midships and is accessible through multiple openings in the main salon and in the aft hallway.Sleeps 7 comfortably. Generous headroom of 6’5” throughout.WORKSHOP DETAILS: Multiple toolboxes organized by project type (i.e. electrical, plumbing etc. ); Shelving, built-in vice, many spare parts, glues, tapes, hardware all included. Many tools - shop-vac, sander, electric drill, hand saws, air compressor.